Kentucky Senator Rand Paul was on the Late Show with David Letterman Thursday night. Paul was promoting his new book “The Tea Party Goes to Washington.” Letterman asked the Senator about the Tea Party platform, and the conversation centered largely around tax cuts for wealthy Americans. It started with Letterman making a joke about Paul’s decision to wear jeans with a tie and blazer and ended with a brief discussion of education funding and the protests in Wisconsin. You can watch the whole clip online. On a side note, while discussing the advantages of the private sector, Paul said Letterman can do better because he has to compete with other late night hosts. This set Letterman up for a joke about Jay Leno, but for astute public radio listeners, the conversation may be familiar. New York Times correspondent Bill Carter—who has written two books about late night television, one of which centers on the Letterman/Leno feud for the Tonight Show—recently discussed late night TV competition on The Sound of Young America. Carter says increased competition has made a few new stars (Letterman, Conan O’Brien, their writing staffs), it’s also hurt late night in general by splintering the audience and ultimately weakening the power of the Tonight Show. Carter certainly wasn’t arguing for state-run comedy shows or regulations on how many shows there can be, but his story connects to Paul’s argument in an interesting way. SouthComm Inc., which owns the Louisville Eccentric Observer (LEO), has named Lauren Feldman publisher of the newsweekly. Feldman comes from the The Sun in Lowell, Massachusetts. She replaces Pam Brooks, who has published LEO since 2003. Brooks will remain publisher of NFocus, which she launched in 2010. In a post on the LEO website, officials say NFocus is growing, and Brooks will dedicate her full attention to the publication. 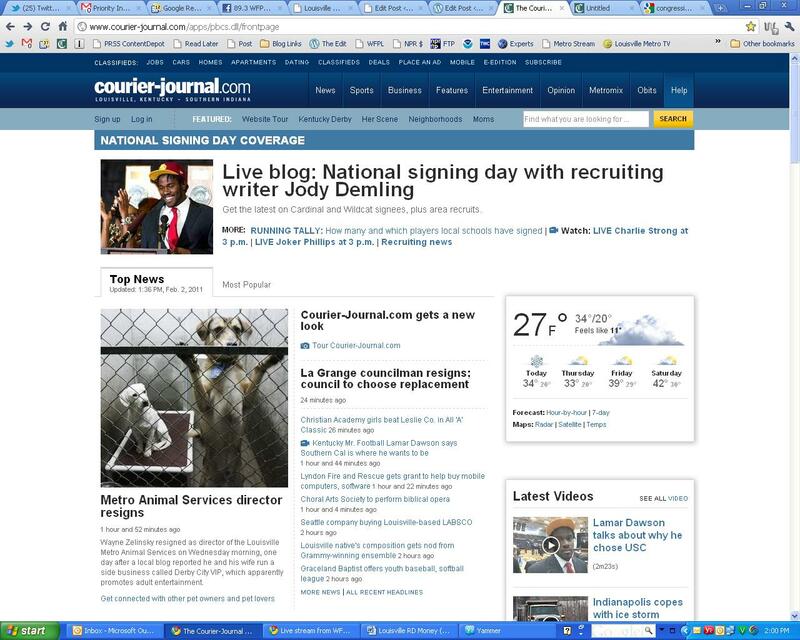 The Courier-Journal has updated its website. The background is no longer various shades of green, but three tones of blue and one of white. The text is sans-serif. The paper even covered the change, which includes some alterations to the comments. Readers can now give comments a thumbs up or thumbs down, and you can log into the sight through Facebook, rather than a separate C-J account. It will be interesting to see how that changes the sometimes divisive (and sometimes insulting to me!) comment section. Keeping in the true spirit of the Internet, early commenters were dismissive of the change. This post comes to us from Graham Shelby. It’s Groundhog Day and in Pennsylvania, a groundhog has fulfilled its civic duty by lumbering outside on a chilly day and declaring that spring is coming soon. An early start to winter. Jarvis says weather forecasters would, of course, like to get everything right, but two out of three isn’t bad in long-term forecasting. That’s because variables in the computer models meteorologists use make accuracy in long range predictions difficult. One tiny error in a complex formula can warp the whole calculation. Still, there is a demand for long-range predictions from scientists, the media and the agriculture industry. Kentucky Parole Board Chairman Verman Winburn fought board member Thomas Whetstone in their Frankfort headquarters last month after arguing about whether Whetstone, who had painted his office door red, was going to repaint it. The Dec. 27 altercation led to a sprained wrist for Whetstone, a Workers Compensation claim against the state and a recommendation that both board members get counseling, according to interviews and public records. In May 2010, Winburn and then-board member Joey Stanton got into a heated disagreement while dining with colleagues at The Lady and Sons, the Savannah, Ga., restaurant owned by celebrity chef Paula Deen, then-board member Patricia Turpin said this week. The water taxi that has taken Hoosiers (and people who are bad at parking) across the river to events at the KFC Yum Center will stop running after Friday. A benefit show for the beloved but financially-troubled Ear X-Tacy music store has been receiving positive reviews.